Well my son returned this weekend from his immersion studies in Kunming China yesterday and boy was he a tired puppy!! Wow the stories he has to tell and the wonderful people he met! One story that sticks with me is when he saw a couple of 30 year old men who were obviously visiting the city..dressed in rural traditional garb, trying to figure out how to use an escalator! We just simply take for granted that everyone would have seen one before..especially young folks in their 30’s. I thought that was a very cool story. Anyway..I will be showing you his pix and the rest of our journey soon. Bry brought back enough tea and Yunnan coffee to keep me VERY happy for a while! HAVE A SUPER WEEK..MORE COMING ON EBAY TODAY! 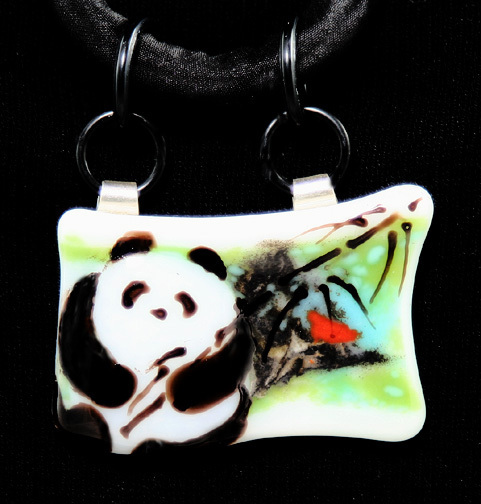 Check out that newest panda necklace when you get a chance..I added an audio description to this one too. This is a full necklace and the whole thing reminds me of a draped wall hanging in miniature..even the glass has a wonderful “flow”. adorable as your panda. I love the 2 bail suspension and, as usual, your glass work is incredible! Another beautiful necklace from Graffiti!!! Thank you soooooooooo much Jan!!!!!! I just love the portly pandas…they are so happy and satisfied looking arent’ they??LOL! Glad you like that suspension system! It was a matter of necessity and what I really liked was the ‘offset’/asymetrical look of it too. The draping of the glass to the side looks very cool on the neck! I showed it to a friend in town and at first glance she thought it was painted fabric!